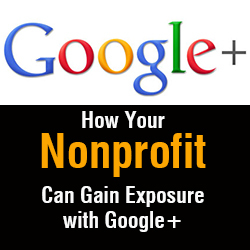 Wondering if Google+ is worth it for your nonprofit organization? Unsure of what it really offers, and if you should invest the time? 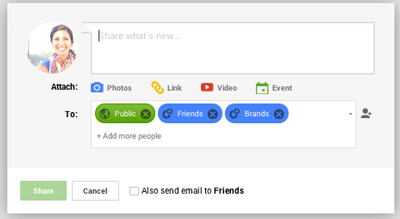 Here’s the truth: because it’s backed by the world’s biggest search engine, Google+ is pretty powerful. Using it can affect your nonprofit’s search rankings as well as connections. So if you want to make the most if this might social network, here’s what your nonprofit needs to do. 1. Optimize Your Profile: Optimizing your profile means uploading an attractive, relevant cover image, as well as a headshot of either the person who is the face of your brand (such as yourself) or your company logo. Next, complete the About page, including links to your website and other social media profiles. Tell new visitors who you are what you do and why they should care. 2. Follow Relevant People and Organizations: At its heart, Google+ is a social network and, as such, it’s a tool for connection. Use it to form relationships with other people you’d like to network with, get to know, learn from, etc. Follow potential donors. 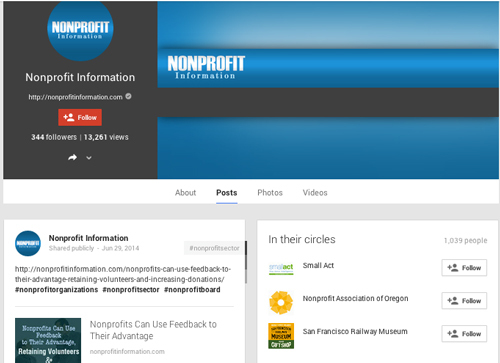 Follow related nonprofits. Follow professionals with whom you’ve collaborated in the past. Then, engage with them regularly by liking and/or responding to the content they post and by sharing relevant content that they’ll find interesting. 3. Give a Window into Your Brand: Use Google+ to give your followers an inside look at your brand by posting images and status updates of behind-the-scenes info: what you’re working on, how you’re prepping for events, new initiatives you’re pursuing, etc. Whenever possible, make your sharing visual, as pictures tend to be more compelling than large blocks of text. 4. Use Hashtags: Just like Twitter, Google+ allows you to use hashtags as a way to highlight relevant search terms for content. So when you post an update, you can add hashtags to make your content easier to find by users. Anytime someone clicks one of those hashtags — either from your updates or from someone else’s — it will point him or her to all content tagged with that term. 5. 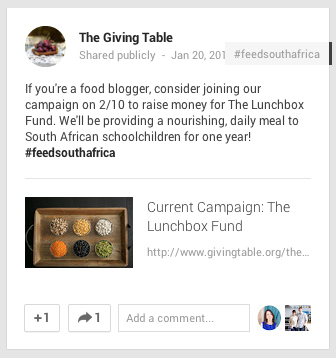 Target Your Messages with Circles: One of the unique benefits of Google+ is that you can target your messages to specific groups — prospective donors, volunteers, colleagues, current donors, etc. To do so, click on a contact’s name and use the built-in feature that allows you to place him or her in a certain circle. Then, when you want to address that group, add its name with a + sign to the “to” line in your updates. When you do, your message will only display to the people you are specifying. 6. 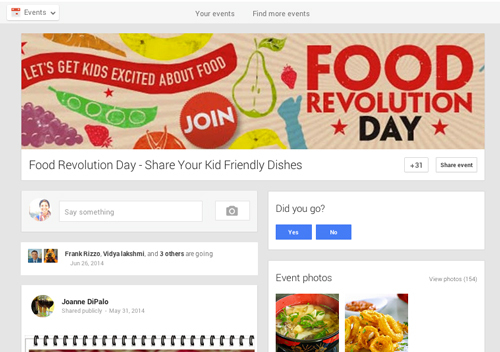 Plan Events: Use Google Events to plan and schedule upcoming fundraising or volunteer events. Set a time and location within the tool, add some information and photos, invite people and make it easy to see who’s coming, all in one streamlined place. 7. 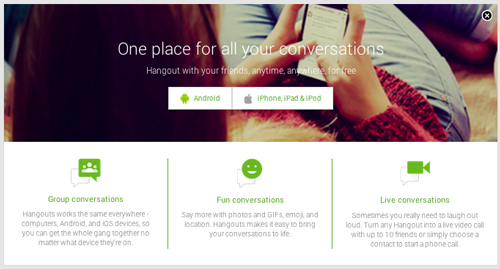 Try Hangouts: Google+ includes a great video chatting tool called Hangouts, which allows you to engage with up to 15 followers at once. Whether you’re holding meetings with remote employees, providing training information for volunteers or something else, this tool can be great for fostering community. There’s also a tool called Hangouts on Air, which lets you stream your videos live to YouTube, making them available to an even greater number of users. 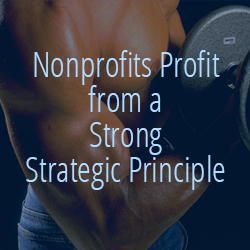 July 21, 2014 By Linda Henman, Ph.D.
For any nonprofit organization, results start with a strong strategic principle—a shared objective about what the organization wants to accomplish. A strong mission and clear vision lead the way, but setting the strategy demands more. Leaders of successful organizations realize that they can’t just run fast; they have to make sure everyone runs in the same race—the right race—without tripping at the finish line. A clear strategic principle helps everyone realize what that means. The strategic principle guides the company’s allocation of scarce resources—money, time, and talent. But it doesn’t merely aggregate a collection of objectives. Rather, this simple statement captures the thinking required to build a sustainable futures that forces trade-offs among competing resources, tests the soundness of particular initiatives, and sets clear boundaries within which decision-makers must operate. Creating and adhering to a concise, unforgettable, action phrase can help everyone keep morale high and direction clear as the race becomes more difficult and daunting. For example, Habitat for Humanity offers one of the most well-known strategic principles: Giving a hand up, not a hand out. This never changes, even when economic, social, and political forces around the organization do. A well-thought-out strategic principle pinpoints the intersection of the organization’s passion, excellence, and unique contribution. As you can see, success lies at the intersection of the three. If your organization operates in section one, you will probably experience some short-term success. People who can do work they feel passionate about and engage in work that rewards efforts with large monetary compensation or recognition can often stay in the game for the short run. But if you don’t offer your “customers” the best, they will choose other avenues for their contributions. In other words, no matter what your organization does, people expect and want you to do it well. Most nonprofits have competitors—other hospitals, universities, or charities—that offer similar kinds of services. But even if you have no “competitors,” you compete for donations, volunteers, talent, and other resources. Passion and excellence without a unique contribution, or section two, won’t even allow you a short run. This undisciplined orientation—to do what you like and are good at—without consideration of the “market,” won’t provide anything other than some short-lived fun, which should last right up until the time your bills come. Section three offers a recipe for burn out. You can work hard at something you’re good at and that brings you success, but you won’t excel at it for long unless you feel some passion for it. 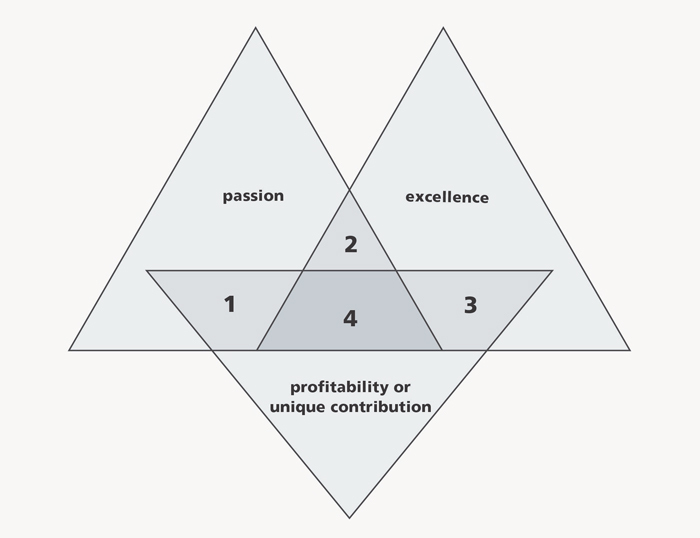 Sustained success lies in area four, the intersection of passion, excellence, and unique contribution. Only here can your organization thrive as you work diligently to produce a product or service that others can’t match. If we stopped doing what we’re doing, to whom would it matter? Who would miss us most? How long would it take another organization to step into the void? The answers to these questions will help you understand and recognize the unique contribution your organization makes. Are we passionate about his work? Can we do it better anyone else can? Will it make us enough money to keep doing what we need to do? When designed and executed well, a strategic principle gives people clear direction while inspiring them to be flexible and take risks. It offers a disciplined way to think about decisions, strategy, and execution and challenges people to play an ever-evolving better game. “Strategic” is probably one of the most overused and misrepresented words in today’s organizations. Executives use it to denote anything they consider important, yet true strategy is limited to those situations that affect critical outcomes. Strategy identifies your unique contribution—something you can do that others cannot match. It defines the nature of your organization, impacts financial performance, and guides your choices. Done well, it allows you to go beyond surviving to thrive, no matter what changes the economy or other forces bring to the future. We live in an era where information is available and can be published by just about everyone; if you’re receiving email, odds are you have the power to forward it to tens, hundreds, or thousands of others with just a few clicks. The typical user is online every day, if not constantly tethered. What’s more, people believe their family and friends far more than they do an organization or nonprofit. Getting your message to spread widely and quickly happens when people get information from more trusted sources, and that requires social media. Social media has become an essential strategy in generating donations for nonprofits and if you aren’t active in social media channels, your nonprofit is missing a huge potential for revenue and other types of support. From Millennials and GenX to Baby Boomers, the vast majority of the world’s population is connected online to one another, to their favorite brands, and to the causes they care most about. But with several active generations, all with different backgrounds and communication preferences, the traditional approach to engaging a group of supporters will no longer work. 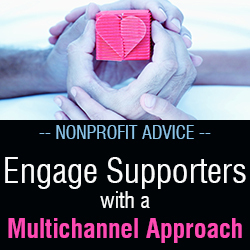 So how can you reach them effectively and get them to support and promote your cause? organization. Read your supporters’ comments, chime in when you think you can add something, ask them questions to learn more, and take note of the type of content that engages them. If your organization covers multiple issues but supporters respond well to one particular issue, focus on that issue more than the others on that platform. Offline and traditional methods for communicating, engaging and organizing are still important but are rapidly declining as each generation continues to age. Nonprofits need to look at creating multichannel campaigns to successfully incorporate the needs of all generations. Research shows that each generation uses a variety of online and offline channels. For example, when responding to a nonprofit’s fundraising efforts, the younger the donor, the greater the number of ways they give. Relying on direct mail exclusively no longer makes sense, but when used with online methods, the result may be different. For instance, a donor may receive a direct mail piece and choose to give online. 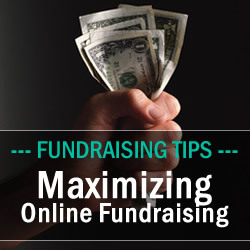 Or donors that are acquired via the Internet may prefer to continue to give through direct mail. That same donor might learn of a cause, or be motivated to support a cause based on something a friend posts on their Facebook wall, but then write a check or donate online. Or, in a natural disaster situation, a donor may respond by making a gift via their mobile phone. All groups can be reached effectively with the right messaging. Millennials are transforming communities, involved in causes that are important to them and are changing the world for the better. They build engagement with word-of-mouth through their social media channels as well as face-to-face events. This generation places a higher value on the opinion of someone with firsthand experience, preferably a peer or close friend rather than experts with professional or academic credentials, to recommend a brand or product. Gen Xers are highly technical, and with added skepticism, they are known to habitually research the purchases they make, which means they will have done their homework prior to supporting a particular nonprofit organization. Gen Xers can be inspired to engage in a particular cause based on what is being discussed in their social media networks. When this group feels they can trust, they will engage and be more inclined to give. Baby Boomers established a connection with the organizations they care about in early adulthood, and are now in a position to give financial support. While many give through direct mail, Boomers are becoming more digital savvy each year and are more likely to value building relationships and trust than any bells and whistles. Thanks to B2C companies like Amazon with advances in micro targeting, all three generations have come to expect a customized online experience – a message and call-to-action built specifically for them. The important distinction to make is that there are very diverse supporters across several different generations that require different communication and prefer to take different kinds of action. To be successful, nonprofits need to understand how each of these groups wants to be engaged and personalize their campaigns accordingly. The answer is yes, if, of course, you leverage your efforts well. Why? People are on email overload only reading the ones they really want with the help of spam filters and Google’s new tabs; they prefer social media where they can control the pace as well as what is important to them. Nonprofits and political organizations today need to be prepared for the social conversation by taking the first steps: listening and going where the conversation is happening. You may not think you have time for social media, but it’s going on around you. Users are now in control of a significant part of your message, not just as users, but as influencers. Individuals are influenced by friends, friends’ friends, and friends’ friends’ friends. Take advantage of the discussion, find out who your online supporters are, personalize your message, and make sure they’re involved with your cause. Whether nonprofits are doing fundraising or advocacy, if they don’t rethink how they are reaching individuals (note we say individuals not people), and understand the modern rules of engagement, they can expect their support to decline as well. Nonprofits who define their communications and match their campaigns up with their supporter’s needs, will ultimately see the results of their efforts. I was reminded recently of a song I learned many years ago in Girl Scouts; the refrain goes: Make new friends, but keep the old, one is silver and the other’s gold. Wise words for young scouts…and fundraisers too! For while much energy goes into acquiring new donors (new “friends” so to speak) comparably little has been written about how to keep your “old friends.” However, if you unlock that secret, you’ll find true gold in your database. Membership organizations like museums, zoos, associations, public media organizations, and a handful of environmental groups that fundraise around a membership model, face unique opportunities, as well as challenges, that donor-based organizations do not. For membership organizations, renewals are focused around an “expiration month.” Typically, the renewal series starts three months prior to the member’s expiration date, with subsequent monthly messages of increasing urgency as the expiration date approaches. This deadline provides a natural sense of urgency and is a powerful tool for any fundraising copywriter – use it to your advantage!! 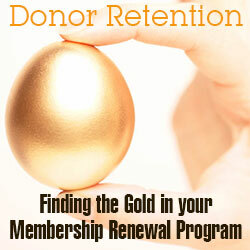 Getting members to renew early has positive cash flow implications. If you can get a member to renew nine months after their join date or previous renewal (rather than 12 months later), it’s likely you’ll be able to mail them an additional appeal within the year, thereby improving your chances of increasing the revenue per donor. The most successful renewal series have a consistent look and feel. Typically, the letter form is the same throughout the series – as are the outer envelopes – but with varying teaser messages. Letter copy often varies for new members compared to multi-year members. And, of course, members are encouraged to renew through whatever means is easiest for them: via mail, online or even by telephone. An E-Renewal series should mirror the mail in appearance, key copy points, and timing. One successful strategy is to deploy E-Renewals the same day that the mail drops. The one exception to this rule is the member’s expire month, when two E-Renewals may prove to be most effective – one on the day the mail drops, and a second 3-4 days before the end of the month, alerting the member to the fact that their membership will expire in just a matter of days. This renewal model comes with its own set of challenges, too. Testing and rolling out new creative in the mail can be a slow process. Don’t let your desire to quickly impact the program send you down the wrong path. Be sure to test over a 3 – 6 month period to ensure a large enough mail quantity and a statistically valid result. Testing over several months will also enable you to take into account any fluctuations due to seasonality. Because of the prolonged time it can take to establish a new control in a renewal series, focus your efforts early in the series where any improvements will have the most impact. It takes a lot of time, money and effort to find new members. Be sure you’re doing everything possible to renew them. Just because it seems easy to raise money online, charities still must understand and consider several issues before accepting gifts on the Internet. Perhaps the most overlooked by many organizations is that they are not exempt from the registration requirements that many states impose on organizations asking for money from their residents. If a fundraisers at a charity have any questions about this, they should contact the state’s Attorney General’s office, which has oversight responsibilities for charities. Even though online fundraising has “grown up,” as the Chronicle of Philanthropy recently put it – these days we are seeing only double digit, as opposed to triple digit, annual increases – organizations cannot just sit back and wait for the money to roll in. The “Donate Now” button, by itself, won’t do the trick. If charities want potential donors to hit that button, they have to see it – and be motivated to give. This means that all the literature and correspondence to prospects need to prominently include the organization’s website address. A website is today’s calling card – people interested in a charity or its cause go there first. Therefore, the website has to be as good as it possibly can be, with programs and other relevant information within easy navigation, so that the “Donate Now” button will mean something. Charities need to feed into its online appeals with social media, such as Twitter, LinkedIn, Instagram and Facebook. And whatever else comes along. Even if any one particular method feels like a temporary fad that will soon die out, todays donors – not all of them the older ones either – are aware of the impact that social media has on their efforts to stay in touch. Staying in touch with the charities they support is and will continue to be important to donors, so it behooves charities to reach them at their level. Although websites will be an integral part of future fundraising, we are still not to the point where every transaction takes place online. And we probably never will be. While organizations need to stay vigilant about technology changes, as well as concurrent changes in people’s attitudes about how they use the Internet, fundraising is not only about clicking a button. Reaching donors at their level means expanding, not contracting options, even if it seems that driving into the future is all about online communications. Face-to-face meetings will always play a role in a successful development effort. While it’s true that a handful of organizations reported receiving gifts of $100,000 or more in 2013 – one, National Christian Foundation, reported a $1 million online donation – despite the rapid growth of online giving, large gifts are still the rare exception. Even when organizations see their online giving results growing, they must still take care to cultivate and steward donors. After taking into account issues unique to this new way of giving (yes, it is still new), wise charities will never forget that the human touch will never be out of style or go out of date. It’s a familiar story. You are ready to launch a new giving campaign – one that you’ve put a lot of time and resources into developing. You’ve gone to great lengths to target and segment your lists and because of that, you know who your supporters are and what is important to them. You’re using your historic performance to forecast what you will get with this ask – it’s not a bad target, but what if you could do more. 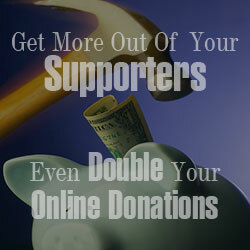 Even double your online donations? Think about how much more ‘good’ you could do. Beyond targeting and messaging, the first thing nonprofits need to do is to remove the barriers to online giving—make sure supporters can give easily, safely and often. And to do that, they need the right tools. With abandonment rates as high as 85 percent, this practice is causing organizations to lose a lot of supporters with that form request. What does that mean for them? Lost donations…not something any nonprofit wants. Don’t give up. There are ways to get around these common barriers and bring in those much-needed donations. Beyond the list targeting and message creation that inspires action, nonprofits need the right tools. They should take time to evaluate the technology they are currently using. Does it work well? If so, great, they should keep using it. But if not, there are options available that can create an easy-to-use and repeatable giving experience for supporters. 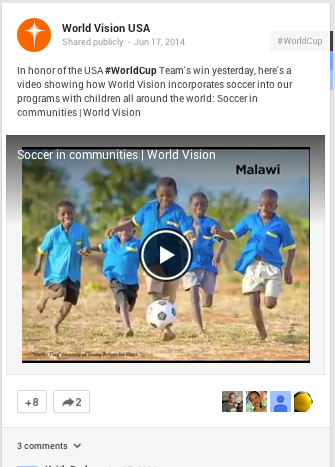 So, what should nonprofits look for in a 1-click solution? A solution that is already getting good enrollment rates (hint: the number should be over 50 percent). If enrollment rates are low, that could be a ‘red flag’ that the solution isn’t working well. Can donations be made using a mobile device? You want to give donors as many ways as possible to contribute to your cause. Is it easy to integrate into your current system? With the solutions available today integration should be simple. Is it secure? You don’t want to expose your donors to potential security risks. Organizations that integrate a “click and give” option into their campaigns will easily see their donations increase – and history has shown that donors with a 1-click option to give, will give three times as often and four times as much! With a simple click of a button, supporters should be able complete their donation – regardless of the device they are using. No forms to fill out, no credit card information to input, just click and give. Fewer steps, more donations. The business community is an excellent source of funds for nonprofit organizations. Include businesses with a history of charitable giving in the community. Note that asking for funds from businesses is a two-part process. First, you decide how to inform the business of the programs of your agency. Then you ask for funds. Invite individual businesspersons to tour your agency and learn more about what you do. Send businesses information packets and newsletters about your agency. 3) Visit businesses personally to ask for funds. You will find that large amounts will only be raised after personal meetings with company representatives. Make sure the individual with whom you are meeting knows about your agency before you make the visit. Include a board member or another volunteer in the visit to the business. Make sure you personally know the individual you are visiting. Bring information about your agency with you to the meeting. A video showing your programs in action is very effective. Send a personal thank you note after completing the visit. Keep excellent records of contacts with each company. Remember that cultivating business donors is a long-term ongoing process. It’s a scenario I’ve seen time and time again as a consultant to nonprofit organizations: board members are told to come to their next meeting with the names of 10 people who can be asked to make a gift to the organization. They nod in agreement, but their expressions tell me that this is something they don’t want to do. Sure enough, a month later, the board members return without the names. I can explain why this happens: people have a fear of asking for money. In my experience, nonprofit board members are far more likely to describe fundraising as “begging” than to say they enjoy it. 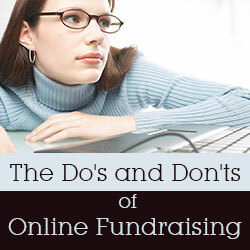 Their hesitancy to ask for money makes them uncomfortable in their fundraising role. This makes them less successful than they must be in order for the organization to have the necessary resources to operate and fulfill its mission. The economic downturn has only added to these anxieties about fundraising. Board members, who may be worried about finances themselves, may be reluctant to ask someone else to support the organization for fear the person might not have the funds available to give. Nonprofits are also struggling to recruit new board members, which can further hamper their fundraising efforts later on. In uncertain times, people are often hesitant to make new commitments. Prospective board members, like many other people, may be piecing together two or three part-time positions or working longer hours to keep their full-time jobs. With less free time, they may be concerned about whether they’ll be able to fulfill the duties of a board member. The challenge to recruit board members and their hesitancy to ask people for financial support has a direct impact on the ability of nonprofit organizations to fund their operations. Many nonprofits are overly dependent on grants or events as a revenue source. But weathering the ups and downs of the economy calls for a more diversified portfolio. It requires gifts from individuals as well as board members who are willing partners in facilitating these gifts. As a result, it’s more important than ever for nonprofits to pursue strategies to strengthen board engagement and involvement. It’s equally important to understand the psychological and societal barriers to asking for money. 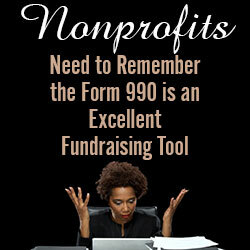 Only then will nonprofit organizations and their board members be fully prepared to achieve their fundraising goals. Nonprofits should start by looking at why board members are hesitant to take on a fundraising role. For many people, fear of fundraising has its roots in childhood. From a young age, we’re socialized to believe that money is private. We don’t talk about it, and we certainly don’t ask other people to give it to us. We’re told that money doesn’t grow on trees and that we should save money, not give it away. The messages communicated to us, both spoken and unspoken, are strong and lasting. It’s understandable, therefore, that board members feel uncomfortable about fundraising. They hold a deeply ingrained belief that it’s inappropriate to talk about or ask for money. These perceptions about money need to be acknowledged early with board members. The time to begin is during the recruitment process. Nonprofits should interview prospective board members about their attitudes toward money and asking for money. They should also provide a written job description explaining that board members are expected to make a gift that’s meaningful to them, in an amount that’s meaningful to them. Taking these steps lessens the likelihood that board members will be surprised when they’re asked to participate in fundraising. Similar conversations with current board members are also necessary. A retreat setting is a good place for individual and group meetings about issues related to money. Giving board members an opportunity to share their societal and family messages about money allows nonprofits to better understand and address their specific concerns. Having these conversations impacts board member satisfaction. Remember that board members are in many ways like any other volunteers. They need to feel comfortable in their role and be willing to continue to fulfill it successfully. Most of all, nonprofits need to remind board members why they ask people for money: it enables individuals to invest in the work of an organization and accomplish something extraordinary that they could not do themselves. Rather than equating fundraising with begging—a dynamic that pits the powerful against the powerless and produces discomfort on both sides—board members should realize that they’re creating a mutually satisfying relationship. There is, however, more to fundraising than asking for money. 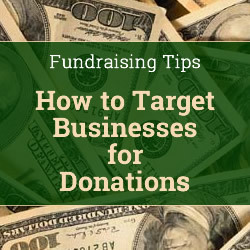 Nonprofit organizations often view fundraising as a two-step process of identifying a potential donor and then asking for a gift. But fundraising can also be seen as a more holistic process—one of development—that includes five key steps rather than two: identification, cultivation, education, solicitation, and appreciation. Looking at fundraising in this way allows board members who are hesitant about fundraising to engage in it without asking for money. It also leaves room for nonprofit organizations to recruit a diversified board, including those whose capacity to contribute extends beyond their financial means. Board members can help nonprofits find potential partners whose values and interests are aligned with those of the organization. They can assist in cultivating a relationship between these individuals and the nonprofit, and in educating people about its activities. This could involve meeting someone for coffee, serving on a special events committee, adding a personal message to a fundraising appeal or writing a thank you note to a donor. Board members who are comfortable asking for a gift can, of course, participate in the solicitation stage. Looking at the responsibility as development rather than fundraising allows board members to take on tasks that will bring them satisfaction and success. It enables everyone who supports the nonprofit—including board members hesitant about fundraising—to participate in ensuring the nonprofit’s capacity to thrive. The work of a board can be somewhat removed from the daily work of the organization. 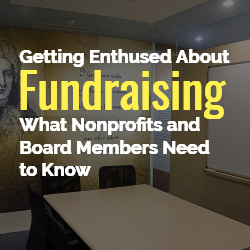 Yet engaging board members with a nonprofit’s programs and services will help them become more informed, motivated, and effective fundraisers. Nonprofit leaders can choose from a number of strategies to increase board members’ engagement. Plan a board action day to directly involve them in activities with clients. Encourage board members to invite the executive director to speak about the organization at a community group meeting, or to make a presentation themselves. Or ask clients to write letters to the board that describe how they have benefited from the organization’s work. Board members need to hear the stories that bring a nonprofit’s work to life. Be sure they know how the organization’s services and programs impact an individual’s well-being or enable people to do extraordinary things. Ask staff and volunteers to make short presentations at board meetings that tell the powerful stories behind an organization’s facts and figures. These are the stories that board members can later share with prospective donors. Also prepare board members for the moment when they will ask someone for money. Fear of rejection often accompanies hesitancy about fundraising. Board members must realize that “no” is not personal. Rather than rejecting the person or organization asking for a gift, the prospective donor may not yet know enough about the nonprofit to be ready to contribute or has already allocated this year’s charitable funds elsewhere. When board members are engaged, motivated, and aware of their feelings about money and rejection, they have a more positive board experience and a greater impact. As I’ve observed in my work with nonprofit organizations, board members who understand their fundraising role, and are comfortable in it, are also more capable of raising money. That’s another outcome of engagement—when people realize they can make a difference in the lives of others, they often become amazingly generous.